"The protection of human rights in Europe is currently at a crossroads. There are competing processes which push and pull the centre of gravity of this protection between the ECHR system in Strasbourg, the EU system in Luxemburg and Brussels, and the national protection of human rights. 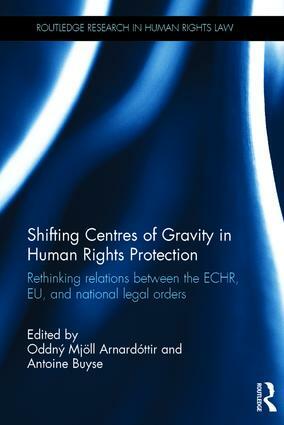 This book brings together researchers from the fields of international human rights law, EU law and constitutional law to reflect on the tug-of-war over the positioning of the centre of gravity of human rights protection in Europe. It addresses both the position of the Convention system vis-à-vis the Contracting States, and its positioning with respect to fundamental rights protection in the European Union. The first part of the book focuses on interactions in this triangle from an institutional and constitutional point of view and reflects on how the key actors are trying to define their relationship with one another in a never-ending process. Having thus set the scene, the second part takes a critical look at the tools that have been developed at European level for navigating these complex relationships, in order to identify whether they are capable of responding effectively to the complexities of emerging realities in the triangular relationship between the EHCR, EU law and national law." 11. Squaring the Circe at the Battle at Brighton: Is the War between Protecting Human Rights or Respecting Sovereignty Over, or Has it Just Begun?, Andreas Follesdal. Many thanks to all contributing authors!